Green veggies, and leafs in particular, are full of good for you nutrients: iron, chlorophyll, and a long list of vitamins and minerals. 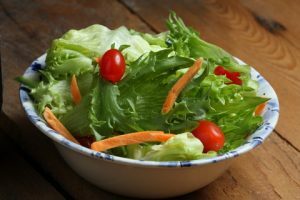 Ideally, you’re getting a pretty large serving of a variety of greens each day, giving you a nutritional boost, a fiber boost for digestion, and supporting good bacteria, which flourish when you eat raw veggies. But realistically, you probably aren’t. Or maybe, to get those greens, you’re pairing them with sugar in the form of salad dressing, lots of fruit, or maybe you’re cooking away some of the nutrients to improve flavor. Most people don’t get nearly the amount of leafy greens each day that they should, and we all sort of know it! So here’s what you can do: sometimes, it’s okay to cheat a little. While it’s better to make sure you eat a diet rich in a variety of fruits and vegetables, it’s better to get those nutrients every day one way or another, like with support from Green PWRx. Green PWRx is all superfood, no fillers or additives. It adds variety to your daily diet with over 30 plants from land and sea, and it has all the nutrients without having to worry about the taste of bitter herbs. Getting what you need nutritionally (like with the help of Green PWRx) can help improve your health in ways that make you take notice. When your body has all the building blocks it needs (in the form of nutrients), it has a chance to function better. Some people feel more energy, have a better mood, or just a better sense of health and well-being. And you get your feel-goods from doing something you know you should: taking in more leafy greens each day. Don’t go another day without that recommended serving of nutrients from rich green plants, make sure you’re getting it with Green PWRx.